On October 13, 1961, Assistant Secretary of the Interior John A. Carver, filling in for Secretary of the Interior Stewart L. Udall at the last minute, delivered the keynote address, entitled “The West Against Itself,” at the first meeting of the newly created Western History Association (WHA). In his speech, Carver expressed Udall’s vision of land and natural resource management. 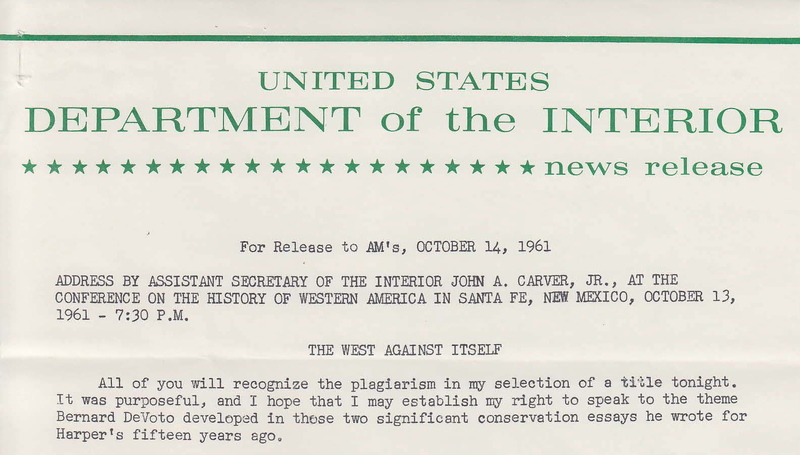 Both Carver and Udall had been profoundly affected by the writings of western historians and their conservation policies reflected scholars’ increasing criticism of the exploitation of the western environment. Carver stated that DeVoto’s essays in Harper’s Magazine,such as “The West: A Plundered Province” and “The West Against Itself,” had a profound effect on his vision of public land management. He embraced historian Walter Prescott Webb’s premise that the heart of the American West was a desert and that the region’s aridness created fundamental “deficiencies” which limited its development. Webb’s essay on the subject in the May 1957 issue of Harper’s Magazine, “The American West: Perpetual Mirage,” stirred public outcry in several western states after Senator Michael J. Mansfield of Montana had the article printed in the Congressional Record. Carver’s invocation of western historians’ writings and the emphasis the works placed on the region’s environment bears highlighting. As the WHA began its official existence, embedded in its consciousness was the gravity of the aridness of the area, the amount of public land, and the close relationship the region’s population had with the federal government. These concepts are nothing revolutionary from our perspective more than five decades distant from that October, yet at that time, Carver provided a critical acknowledgement of the deficits. The concept of deficiency had outraged several senators, namely Wallace F. Bennett of Utah and Arizona’s Barry M. Goldwater, who had objected to Webb’s use of the word deficient, which they interpreted as describing the region’s value to the nation. However, residents of the American West knew differently. Attempts to conform development in the Great Basin and Colorado Plateau, Mojave and Sonoran deserts, and other arid areas, to national standards of prosperity had left its minimal water resources depleted and its society second-class. Carver declared, that the old pattern of land and natural resource management driven by a “Neanderthal morality” and “the luxury of frontier wastefulness” was at an end. His emphasis on scarcity and thus conservation challenged the national narrative of abundance. Carver’s speech marked the national prominence of scholarship on the American West and a sea change in public land management.